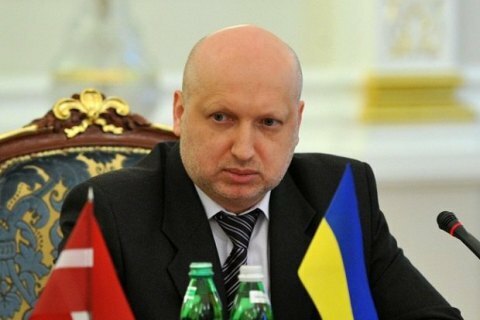 Turchynov is ready to contribute to correcting the flaws of the system in his free time. The National Security and Defence Council has denied the allegations that it may be involved in disrupting the launch of the e-declaration system in its full capacity and with a proper certificate of data protection. "Due to the provocative mention the NSDC Secretary's surname in the context of issues related to the introduction of the e-declaration system and efforts of "regular corruption-fighters" aimed at provocations of the employees of some media to distort objective information, the NSDC press service is forced to make a statement. "The Staff of the NSDC of Ukraine is one of the few government agencies that works effectively in difficult conditions of military aggression and socio-economic crisis. NSDC of Ukraine and its Staff saved the prestige and influence, without replacing the government bodies, and operate solely within the legislation and the Constitution of Ukraine. "We emphasise that the powers of the NSDC of Ukraine, its staff, and the Secretary of the NSDC Ukraine do not include the implementation of the e-declaration system. The National Agency on Preventing Corruption (NAZK), an independent body that was elected on a competitive basis in an open and transparent manner, is responsible for its implementation and functioning. Neither President of Ukraine nor the Cabinet of Ministers of Ukraine nor, least of all, the NSDC of Ukraine has any impact on NAZK. Stories about any political quotas in NAZK are cynical lies and provocations. "State examination of the CISS (complex information security system) of the e-declaration system was carried out by the State Service of Special Communications and Information Protection of Ukraine - the central executive body directly responsible for information protection. Derzhspetszvyazok, like any other central authority, is neither directly nor indirectly subordinated to the NSDC of Ukraine. "The NSDC of Ukraine does not submit or approve nominations for the positions of heads of central authorities, including the State Service of Special Communications and Information Protection, and does not affect their appointment by the Government. At the same time, the head of the State Service of Special Communications and Information Protection Leonid Yevdotchenko is a high-level professional who works fairly and impartially. "Over the past several weeks, "regular corruption-fighters" had placed active political and administrative pressure on the leadership of Derzhspetszvyazok and state experts forcing them to issue the certificate of conformity of the e-declaration software for the CISS. "At the press conference, where the participants derailed the national currency (flushing it down the toilet), it was stated that the issuance of the certificate of conformity of the e-declaration system for the CISS was not legal but political issue. We disagree with this statement. This issue indeed is not legal but in no way not political. Political statements and planted articles can not replace the need for reliable protection of state databases. Therefore, this problem lies solely in the technical and technological dimensions. "1. Why the development of software, on the quality of which the functioning of e-declaration system, the effectiveness of anti-corruption struggle, the authority of the country and the fate of hundreds of thousands of citizens of Ukraine depend, was assigned to a little-known private firm? "2. Why the deadlines for software were broken? Under the agreement, the deadline for five software modules was 30.06.16. Only three modules were submitted for the examination of the State Service of Special Communications and Information Protection. All the talks about the fact that "the lack of integrated software doe not affect anything and will be once finalised" are aimed solely on ignorance of the audience of these statements regarding the operation of complex software and its protection. In the event of timely implementation of the agreement (until 30.06.2016) it could have been possible to conduct the preliminary examination, quietly correct all the flaws, receive the certificate of conformity and launch the system even on August, 1 and not August, 15. "3. Why even three of the five modules completed and submitted for the examination do not meet the CISS requirements? "4. Why did the software developers and clients do everything to block the state examination? It is known that private "experts" targeted in financial fraud investigations were engaged. The materials required for the examination were submitted only on August, 10-11, i.e. one or two days before the scheduled completion of the examination. Instead of transparent cooperation with state experts, which was to be launched before the end of the examination, their public humiliation and harassment were organised. "5. And the last question: where is the e-declaration SYSTEM itself? "This is a sophisticated hardware-software complex, which apart from software should have powerful servers, management system, secure communications and so on. "According to available information, the entire "system" consists of several servers rented by the private entity; "a piece" of uncertified software was downloaded to these servers, and NAZK has nothing to do with them. "Why all those who "flush the currency down the toilet" are silent about this? "It is not our task to analyse where and how the money, provided by Ukraine's partners to "regular corruption-fighters", clients, software developers and their support groups, was used. However, when the deadlines for software development were broken, and instead of integrated software only its "important part" was put into operation, those responsible took cynical offensive instead of apologies and appeals for help. They were deliberately delaying the submission to the examination of low-quality material and organised the dirty campaign of harassment of state experts, hoping that the lack of time, the political and administrative pressure will force state experts to resort to forgery and issue the Certificate of conformity. "When these plans were frustrated, a new version was fabricated hastily - "the rebellion" of senior officials and "the ubiquitous hand of the NSDC". All this baloney was complemented with attempts to spread panic about the hryvnya exchange rate and announcements of mass autumn riots. All this suggests that the disrupted preparation of much-touted software was not accidental. "And the last thing. E-declaration system in the country will function despite provocations, dirt, and unprofessionalism. When those who took up the resolution of this issue, but instead of quality work created serious problems, will be unable to correct the flaws and to complete the work, we suggest contacting the Secretary of the NSDC of Ukraine, who in his free time can organise the development of the e-declaration system in a qualitative manner and within short timeframes."